Posts/News related to the 2015 CHS Band Trip to Disney World in Orlando, Florida. We had a great BBQ fundraiser turn-in this past Thursday but we still have a way to go to reach our goal. So please keep selling and telling! You can sell tickets all the way up to the day of the event. 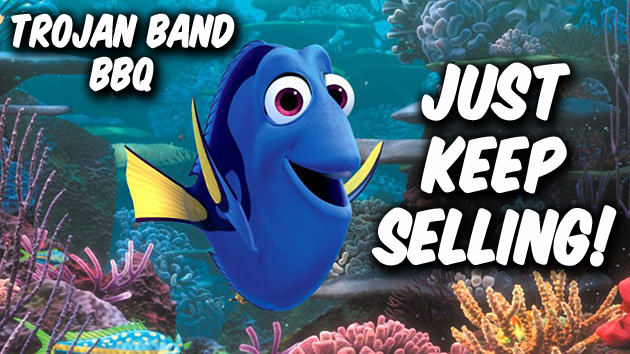 If you turned-in your left-over tickets or need more tickets, please stop by the band room and Mrs. Dothard will provide you with more. Remember to remind those who don’t by tickets that they can still come the day of the event and purchase a meal(s)… Walk-ups are welcome! It is also a great idea to mention the BBQ to those you encounter on the day of the event so that they can stop by and pick-up lunch or dinner with us. If anyone in or around the Carrollton area needs to purchase tickets and has not been approached by a band representative, please contact us at: chstrojanbands@gmail.com or just drop by on May 7th from 11am to 6:45pm at the visitors’ side of Grisham Stadium. We hope to see you there! 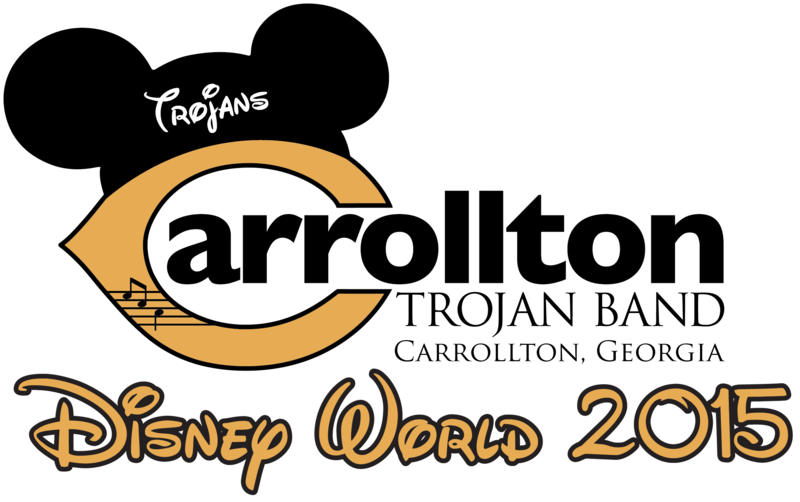 Posted in 2015 Disney Trip Info, Fundraisers and tagged Carrollton High School, Carrollton High School Band, Carrollton Trojan Band, CHS Band Program, CHS Trojan Band on April 26, 2015 by CHS Trojan Band. What a wonderful celebratory trip that we were able to experience together. We earned a wonderful Golden Mickey Trophy to display which continues our long tradition of representing our community with excellence both locally and while traveling. The students received Disney Performing Arts “Mickey Ears” as a souvenir for being an honorary cast member and performer, but most importantly we created memories that will be cherished for the rest of our lives. The trip was very enjoyable. The students exhibited first class behavior during the entire trip. They were responsible, cognizant of each other, and diligently respected the itinerary, which allowed us to make the most of our time in Orlando. They were also very creative with their “selfie” submissions which helped us check on their well being and provided us with more enjoyment. Our chaperones have been very complimentary of our students’ behavior and for this I am most proud! We were also blessed by a wonderful team of parents who served as chaperones and accompanied us on our journey. I am humbled by the flexibility, selflessness, thoughtfulness, and compassion that our chaperones showed our students this week! Our trip was extra enjoyable because of everyone’s willingness to lend a hand and continually check on the safety of our children. I feel like we provided the perfect balance of discipline and leniency to allow the students to practice independence in a safe environment. It is evident from the continual chatter on the bus that the students really enjoyed the company of their friends, chaperones, and staff which has left an impression on who they continue to become. From the students and staff I hope that the chaperones feel appreciated for their tremendous efforts this week! The trip wouldn’t have been so amazing without you! I am sure that many of you have heard about the nail in the tire, or the initial rooming mix-up, or the AC on the bus going out on the way home, but I am proud of the way that everyone handled themselves throughout these small challenges. As I have always been told, “You cannot choose what happens to you, but you can choose how you react.” I feel like we all had many team building opportunities full of fellowship that helped us grow as a band. We have a strong team and it is getting better everyday! No one played too small a role in making sure that our students were safe and that we all had a great time. Thank you from our band staff to everyone who was a part of the trip. I’m already looking forward to the next time that we get to travel together! It is very important that all students are at school tomorrow and continue their dedication and effort to be a great student daily, especially if they attended this trip. It would be really easy to make an excuse of being tired because of our full itinerary while in Orlando and allow your child to be absent tomorrow, but we will be more likely to be supported with a similar trip in the future if we continue to maintain our work ethic and prove our commitment to our schooling. This trip was not very convenient for our other teachers in the building, but they supported us along with our administration. We have already missed 3 days of school, let’s be diligent and get caught up. I look forward to seeing all of you at school tomorrow! Posted in 2015 Disney Trip Info, CHS Band on February 1, 2015 by CHS Trojan Band. Are You Ready? Important Last Minute Disney Trip Details! Well when we planned our Disney trip over ten months ago it seemed as if the departure date would never arrive, but here we are with just a little over a week to go before we hit the road to Walt Disney World! While at Disney we will represent our school and community to an international crowd of thousands and show them that what a “Gold Standard” school system and band program is all about, so we ask our community to keep us all in your thoughts and prayers for safe travel and a wonderful time. Disney Chaperones – There will be a MANDATORY chaperone meeting this coming Tuesday, January 20th at 6:00pm in the CHS Band Room. Chaperones, this is were you will get the details about your assignments and responsibilities, so it is imperative that you attend this meeting. Disney T-Shirts – We will begin distributing Disney t-shirts very soon, possible towards the middle to end of next week, just in time to get them packed and ready to go! Updated Itinerary; Re: Departure Time – This is a very important update! Since we are leaving on a regularly scheduled school day, we want to ensure that our departure does not cause any disruptions to the school buses that use the turn-around in front of the band room. So we are pushing our report time on Wednesday, Jan. 28th from 7:00am to 7:30am. Please, if at all possible, DO NOT REPORT EARLIER THAN 7:30AM. If you must drop your student(s) off prior to 7:30am, please utilize another location on campus so that can easily walk to the band room, like the horseshoe loop above the band room, which is accessible from Trojan Dr./Frances Pl. Thank you for your cooperation and understanding… trust us, no one wants to be “that guy” on a regular school day! For your convenience, we re-posting the links to all of the 2015 Disney Trip forms below, which have been and are still accessible from the “Form” page of our website. 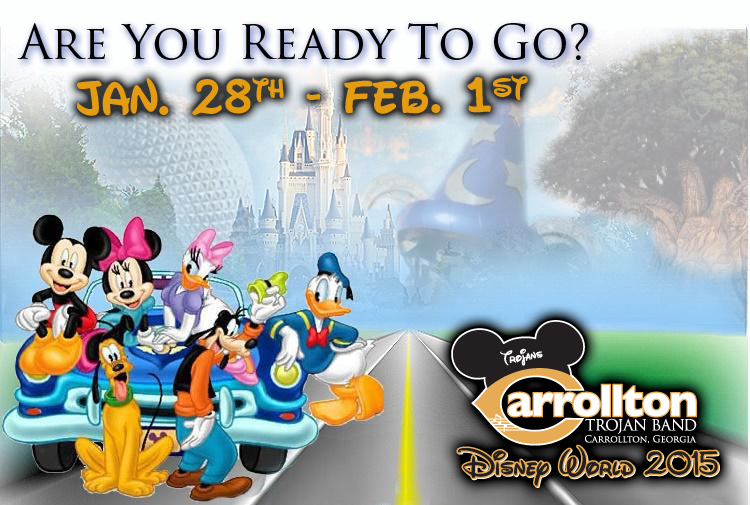 Posted in 2015 Disney Trip Info, CHS Band and tagged Carrollton High School, Carrollton High School Band, Carrollton Trojan Band, CHS Band Program, CHS Trojan Band, Trojan Disney Trip on January 18, 2015 by CHS Trojan Band. Everyone going on the Disney trip at the end of this month as a student, staff or chaperone will be given a FREE gold, Disney Trip shirt to wear while we are at the Magic Kingdom, compliments of Grillo & Associates. We are also taking orders for those wishing to purchase an additional shirt(s) or for anyone else who wants one. Orders will be taken through end of day on Monday, January 5, 2015. To place an order, please download an order form from this link: Additional Disney Shirt Order Form Pricing and examples of the shirts available can be found on the order from. Orders forms and payments should be dropped off at the band room in a sealed, clearly marked envelope and deposited in the Band Booster box located on the wall behind Ms. Dothard’s desk. Make sure to include your completed order form and payment. Please make checks payable to Trojan Band Boosters. No orders will be accepted without payment. Posted in 2015 Disney Trip Info, CHS Band and tagged Carrollton High School, Carrollton High School Band, CHS Band Program, CHS Trojan Band on January 2, 2015 by CHS Trojan Band.